An over-sized Ruffled Chiffon Rose (6cm) in Bridal White, carefully positioned and hand-stitched onto our prettiest Rachelle Lace Bridal Garter. Long cascading tails of Bridal White French Satin Ribbon fall delicately from the Chiffon Rose. A very feminine Wedding garter that exudes a gorgeous touch of Vintage. Our Bridal Garters are made to your exact leg measurement and are so comfortable to wear on your Wedding Day. An over-sized Ruffled Chiffon Rose in Bridal White, carefully positioned and hand-stitched onto our prettiest Rachelle Lace Bridal Garter. Long cascading tails of Bridal White French Satin Ribbon fall from the Chiffon Rose. Our Elle Bridal White Wedding Garter is a very feminine Wedding garter that exudes a gorgeous touch of Vintage. Our garters are made to your exact leg measurement and are so comfortable to wear on your Wedding Day. You will love our packaging! Your beautiful Wedding Garter is carefully packaged into our matte white luxe styled box, with a magnetic closing lid that is tied and secured with a silky Satin Pink Bow. 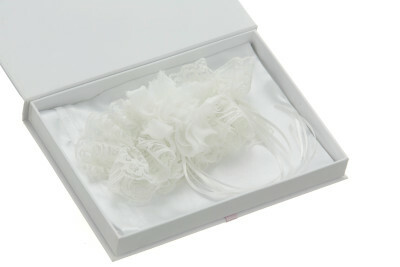 On opening your luxe box, you will find your gorgeous Garter sitting inside, nestled gently onto its own White Satin bag. This will keep it safe and sound until your Wedding Day and is perfect to store your Garter in for the years ahead. Be the first to review “Elle Bridal White Wedding Garter” Click here to cancel reply.